During the summer months, the rooftop at 675 Main Street provided a place for local students and community members to routinely visit the unique garden paradise while tending to their own vegetable and herb plants. Fall has arrived and the rooftop is expanding its community programming to now include weekly tours open to the public and Friday movie night for Macdonough students throughout October. 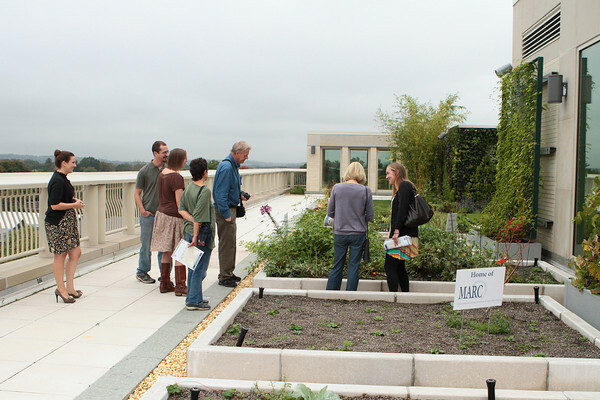 Starting last Thursday, October 4, CHC has been promoting Rooftop garden tours open to anyone and everyone who is interested in experiencing all the roof has to offer. 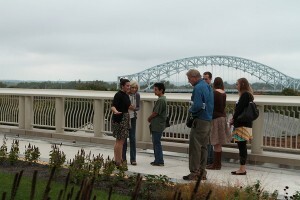 For an indefinite amount of time, (depending on the weather) every Thursday from 12:00-12:30pm, Charise DiPierro, the site director of Middlesex County, will be acting as a tour guide for guests to observe our student organized garden plots, beautiful views of the Arrigoni Bridge and Downtown Middletown along with the living wall consisting of a vertical garden that is 100% self-sustained and soil free. Another bonus of checking out the roof is learning about the environmentally friendly, energy-efficient features such as a renewable solar hot water system, and a high performance roof system that reduces heat island effects. The first week had a good turnout of people who heard about the tours from patch.com or from seeing a sign in the waiting area. Guests were very impressed with the breathtaking views and the beauty of all the different types of horticulture spread throughout the space. 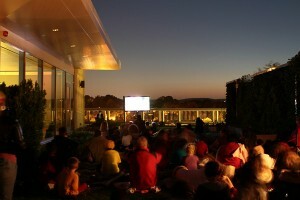 We are also very excited about the newest roof top event that gives students and families a chance to enjoy the roof for Friday Movie Night while coming together in a close knit environment. During the month of October, students from Macdonough Elementary School have been given the option to choose 1 of 4 movies that are being shown at the Health Center. From 7pm-8:30pm, the roof top is transformed into an outdoor cinema for families to come and enjoy the amazing night-time views of Middletown, grab some popcorn and enjoy a family friendly film on a Friday night. The school has been more than helpful and grateful for this new opportunity that has proven to be a hit just after the first week. Over 65 people brought blankets and dressed warm for fall weather while they enjoyed Dr. Seuss’s “the Lorax”. The general consensus from parents and caregivers is that they thoroughly enjoyed the community atmosphere. Not one person complained about being too close to another group’s blanket and people were happy to see teachers, peers, family and friends all together in one place. There are still three Friday nights to come and we are thrilled that the roof can be shared for such an amazing activity with Macdonough Elementary school.